Today there are several great scopes on the market and two of the most well known for accuracy and quality are produced by Bushnell and Zeiss. Nikon; however, has introduced a rifle scope that comes in quite close in providing excellent brightness, even in low light situations. The new Nikon rifle scopes allow you to see well into the evening with 95% light transmission. 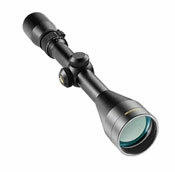 The Nikon Monarch UCC is a variable power scope with 3-9x40 topped off with a matte finish. Like most of the other Nikon rifle scopes, this sight comes with 95% light transmission as well as an Ultra ClearCoat technology that allows for great anti-reflection in the field. This model is guaranteed to be 100% waterproof as well as shockproof and fogproof. The Nikon Titanium rifle scopes are nothing to be scoffed at either. This particular brand of scope from Nikon offers excellent brightness and clarity combined with an unmatched ruggedness. Regardless of where you're shooting or what type of hunting activities you are taking part in, this scope is sure to deliver with its strong titanium construction and an adjustable 44mm objective lens. Whether you're working in bad weather or low light situations, this rifle scope delivers. The Buckmasters lineup from Nikon rifle scopes also works well in a variety of field situations. Like just about every other scope from the Nikon lineup, this series of scopes enjoys strong waterproof, fogproof and shockproof construction, allowing it to perform under many different field conditions. In addition, the Buckmasters series comes with positive click adjustments up to ¼ minute. A scratch-resistant matte finish along with a no-glare construction complete the great benefits offered by the Buckmasters series. For hunters who are looking for a scope that will perform in a variety of situations, the 3.9x40 scope from Nikon Buckmasters is one of the best. Not only is it extremely reliable and durable as well as accurate, the price tag is very affordable. With a larger field of view, this scope is an excellent choice regardless of whether you are hunting game or working in different settings.